All Standard Models Include . . .
Molded insulation with ceramic fiber blanket lining provides exceptional insulating properties, speeds heat up time and greatly reduces power consumption. Furnace walls backed up with molded insulating materials to form rigid, durable unit. Heavy duty, low watt density heating elements for maximum element life located in the top, bottom and both sides of the heating chamber. A heat resistant chrome-nickel-alloy hearth plate which resists wear. Hard, wear resistant refractory door sills and door to withstand abuse. 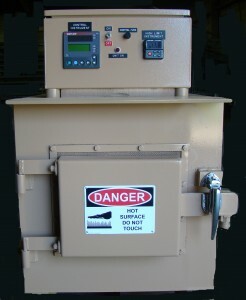 Heavy gauge, welded steel furnace case. The digital control package is standard on all models. Safety door switch interlock for power control. Power is off when door opens. HTE-46 6W - 4H 6.5W -5H-9D 18W-22H-18D 5.5W - 8.5L 2 120 1 20x20 170 lbs. HTE-1212 12W - 10H 14W-14H-20D 39W-29H-35D 12W - 22-1/4L 10 240/480 1 or 3 36x42 910 lbs. HTE-1414 14W - 14H 16W-16H-29D 46W-31H-42D 13-1/2W - 27L 15 240/480 1 or 3 42x48 1,238 lbs.